We are true animal lovers and have been involved with them all of our lives and believe no dog should be without a "furever" home! 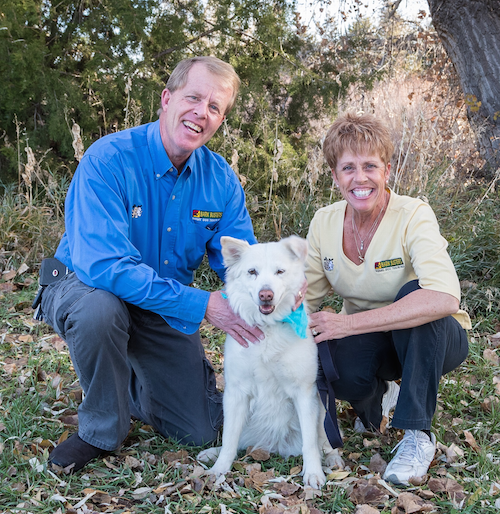 Read how we can help improve your relationship with your dog and improve his or her behavior. Andrea is amazing with our new rescue, Cash! She helped us see things from Cash's point of view which showed us how to be better "pack leaders" for him. After just one visit, our pup is already able to spend time alone without constant whining or destructive behavior (he has bad separation anxiety), is no longer pulling on the leash during walks, and seems much more "at home" with us now. Andrea was truly the voice of our dog in the training sessions and we contribute our happy, calm pup to her dedication and training style. If you want a trainer who is knowledgeable, thorough, dedicated, and dog-centered, Andrea is your trainer! Bark Busters was the perfect experience to help our good boy become even better and we are so excited to continue working with Andrea in the future! Andrea was amazing and had a great attitude throughout. She came over to help us with door training and leash obedience. 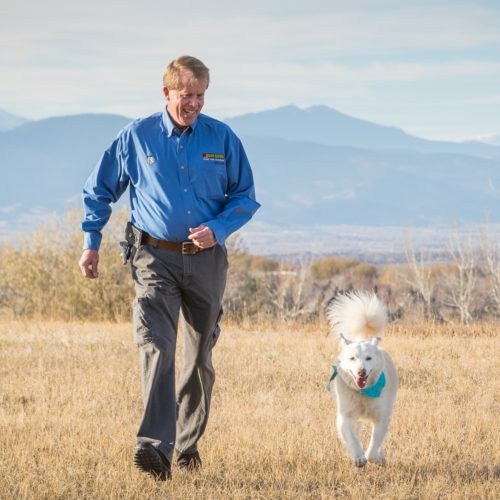 We saw almost immediate results with our dog, and were fortunate enough to have a number of outside stimuli to test the training right off the bat. Two random strangers came to the door during our session, and we were able to put the techniques she showed us to work in real time, with great results. We also found a cat and several children on scooters while practice leash training, and Ruby was unfazed. Can't recommend their services highly enough, thanks Andrea! Before Andrea started training me and my big ol pup, Norman (136 lb, 1 year old, English Mastiff) I was unsure of how to fix his behavioral issues. Turns out the ways I thought were helpful were probably just making his behavior worse and I was confusing him even more. Now with the help of Bark Busters training philosophy and Andreas patience and support, I can walk Norman around the neighborhood without him rushing/lunging at every person or dog in site! She taught me to be confident and guide Norman to correct/polite behavior. Walks are finally enjoyable and I'm not getting pulled across the street anymore or having my shoulder pulled like crazy. The trust Norman has in me is an awesome feeling and it just grows our bond more and more. The little tips and tools Andrea gives can and will make huge differences in your pups behavior. Plus she is a fun, loving, awesome lady who cares a ton about animals which makes working with her fun and rewarding. Thanks Andrea! You're a life saver! Andrea was amazing. After our second training session, I really felt like I could be a leader for my dog. Andrea is great at making dog owners build confidence in their dog training abilities. My dog has become so much better with other dogs (even though we still have a lot of work left to do!) and we can even get him to heel on most walks! The training methods seem to be working very well for us. We are seeing more and more successes everyday as we work with our dog using the training methods Andrea taught us! The training equipment provided have become life savers. Overall, working with Andrea has been a wonderful and well-worth it experience. It's hard to believe we have had so much improvement with only two sessions! Wish we found Andrea sooner! Andrea is fantastic. Our dogs love her, they respect her, and respond to her. But more importantly, so do we humans. The training isn't magic, and if the humans don't keep reinforcing the lessons, the dogs will lapse into old behavior. But that's not a problem for us, because Andrea works on training US, our dogs. By teaching us to be better owners/handlers, she's giving us the skills and tools we need to have our dogs behave the way we want ! regardless of how long it's been since the last session. Over the last 18 months, we've learned that the Barkbusters techniques really work to train dogs, and Andrea's techniques really work to train us! I can't speak highly enough of the sessions we've had. We were immediately hooked and purchased the lifetime package after the first session with River, and before we even brought Odin home a year later. We've been through Humane Society and PetSmart classes before â€¦ but for these and all future dogs, Andrea and Barkbusters are where we're turning. My two year old mini labradoodle, Bowie has suffered from separation anxiety since he was a puppy, but it got a lot worse when we moved out of state - he was unfamiliar with our new apartment and would howl and cry when we would leave him. Our neighbors weren't too fond of the noise and it got the the point that I would feel guilty for leaving him even for short periods of time. Bowie was immediately responsive to Andrea's training techniques - we worked on leash pulling, separation and barking at the door. I was so surprised - he picked up on the training within a two-hour lesson and was exhausted afterwards! We have continued to do separation training with him and we are finally able to leave the house with peace of mind! Thank you, Andrea!! Andrea is great! Very patient with us while we are learning to communicate with Archer. My dog was immediately responsive to Andrea. From the beginning, we had immediate door "welcoming" training which has been needed. The leash training we received was unbelievable and I learned my actions are encouraging my dog to pull on the leash. It was amazing seeing with one visit that my dog has incredible leash skills. Great advice and guidance the entire time. We learned so much! I am a big supporter of the program. Andrea did a great job explaining the Bark Busters technique. The technique gives us various tools for addressing our dog's barking, leash pulling, and pillow chewing. I was amazed how our dog obeyed us without us giving him treats or punishment. Our dog had fun and so did we. So far, we just had our first lesson, and we have been implementing what we learned. We have another lesson scheduled, and we are looking forward to continuing to work with Andrea! P.S. Andrea is super nice, accommodating, and lots of fun! Riley is 12 1/2 years old and Rosie is 2 1/2 years old. Both dogs are rescues and had a lot of trauma issues which manifested into barking/lunging at UPS trucks, school buses, at the front door and at the back fence. They both began lunging at other dogs when we walked them which caused us to hide behind bushes and run to the other side of the road! It was not fun to walk them! Andrea came to our rescue with amazing tools to help our poor pups! She is an leader and is teaching us how to be one so that our dogs will be able to feel safe with us and others. We are happy to report that we have seen wonderful progress...after 10 years, Riley is no longer lunging at school buses, Rosie is learning to walk on a leash without growling at other dogs and we are enjoying our daily walks!